During a Spirit Dinner Cruise of Washington DC, you can view the magnificent cityscape and harbor lights while enjoying lively entertainment and a candlelit meal. After an exciting sendoff, the ship will depart the pier and guests will be escorted to their tables. Although some tables accommodate eight or more passengers, you can request an intimate setting for smaller parties of two or four people. Planning a cruise on Spirit? Use the following Promo Codes for special discounts! There is an extensive assortment of menu items prepared by the ship’s executive chef and the experienced culinary team. The buffet includes delicious appetizers and luscious desserts like vanilla bean cheesecake as well as fresh baked goods, such as artisan breads. Passengers with food allergies or other dietary restrictions can request alternate menu items. Accomplished singers entertain guests during dinner and then DJs play a mix of the top hits from various musical periods and genres. You can enjoy the amenities and entertainment that are available on all three enclosed levels. As the festive evening unfolds, the ship will sail past several landmarks located along the Potomac River. Passengers can experience the District’s impressive waterfront and evening sky from the open-air upper platform or the enclosed, climate-controlled compartments. When you take a Spirit Dinner Cruise of Washington DC, you travel back to the bygone era of glamorous ocean-going luxury liners. The cruise is a fun way to celebrate a special occasion like a family reunion, graduation or anniversary as well as a corporate event such as a product launch or promotion. 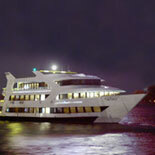 Rain or shine, the three-hour cruise sails from Pier 4, which is situated at the corner of 6th and Water Streets, SW.